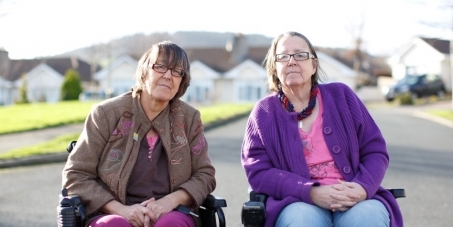 Margaret and Ann have been on an almost three year battle to obtain appropriate wheelchairs from Co Wicklow HSE. Margaret said “They said they’ve given us appropriate ones! They are NOT. Why would we beg, grovel, scream about them, why would we demonstrate outside Dail about them, why would we continue to plead our case. The intransigence and cruelty of Co Wicklow HSE is beyond barbaric now. They know the distress w are in. Our local Occupational therapists are good people but it’s their MANAGERS who are refusing to see our suffering. The last alleged ‘skilled’ assessment was a farce, with a key section left blank. Interestingly the very section I complained of about my wheelchair. Deliberate or no?! We have had to now start a petition. We tried fundraising but that failed. 62 year olds don’t have quite the same draw as a 5 year old. That’s reality. So now we are hoping the petition will stir the hearts of the occupational therapy managers.